Feodor IV Anovich (Feodor I) was born to Anastasiya Romanovna Zakharina-Yureva and Ivan IV, the tsar of Russia in 1557. Feodor I succeeded his father in 1584 as the tsar of Russia. He was both physically and mentally weak and he took no part in government. Boris Godunov (brother-in-law of Fedor I) ran the day to day affairs of the governing the country. Feodor died childless in 1598 thus ending the direct line of Rurik dynasty. The throne of Russia was transferred by vote of zemsky sobor (assembly of the land) to Godunov. 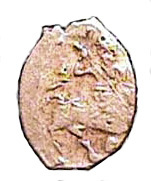 Silver Denga of Feodor I. 1584- 89 CE. Obverse: Horseman with a spear in his hand.